Problem selection is based upon National Common Core Standards. 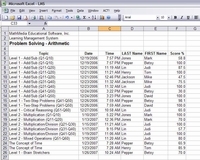 Educational Testing Computer Program - This interactive arithmetic problem solving program is for elementary math students who have mastered the mechanics of the operations on whole numbers. With over 200 menu-driven practice problems (divided into 10-problem, 30 minute sections), students will be able to focus on reading the words, deciphering the meaning, and applying what they know about basic arithmetic. 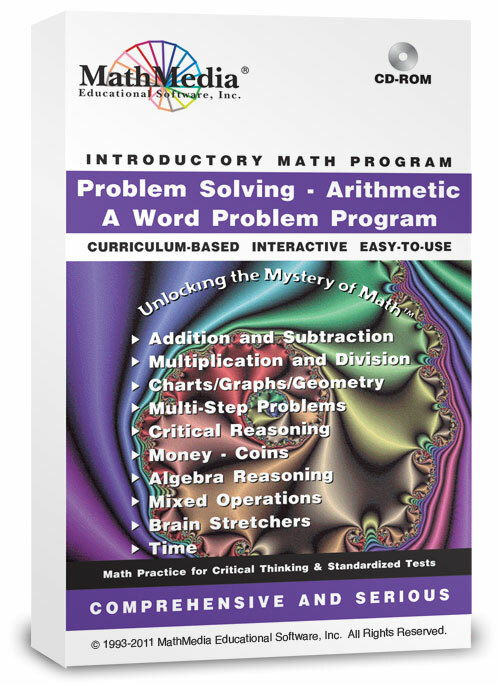 Please note: The MathMedia "Arithmetic Series" (set of 5 skills programs) also contains math word problems scattered throughout the five-program package. This is a comprehensive math word problem program which concentrates on math problem solving practice and techniques for elementary arithmetic students, especially those preparing for standardized tests.